I spoke to Michael at (some) length back during the peak of OWS. He was a rational, even-tempered advocate of the movements’ causes, numerous as they were. He seemed equally at home with those occupying the lawn by the old Town Hall as with the passersby trying to make sense of it from the outside. If nothing else, you have to admit that an ability to bridge divides is a quality both valuable and scarce among politicians these days. Read more by Jim Morrill at the Observer. Michael Zytkow has done something that apparently nobody else has ever done: successfully petition to get on the Charlotte City Council ballot. 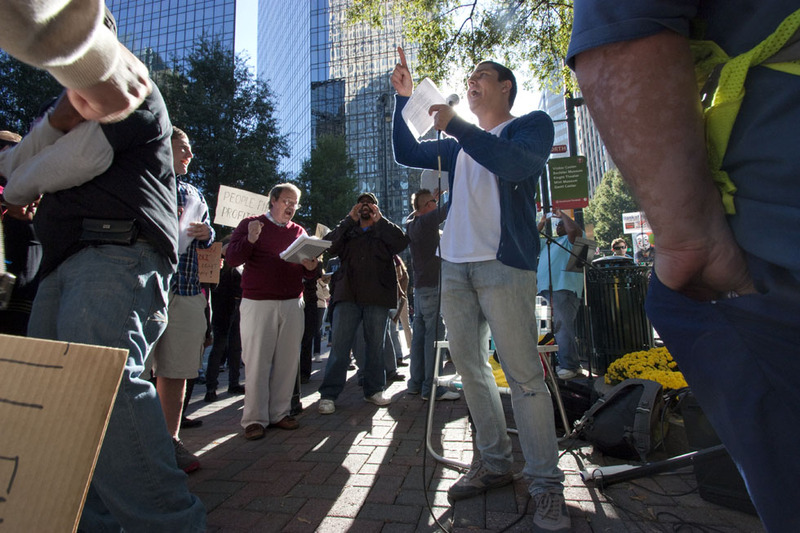 Mecklenburg elections officials said Tuesday that Zytkow, a former leader of the Occupy Charlotte movement, reached the threshold of 3,063 petition signatures. Zytkow, 27, plans to pay his filing fee Wednesday at the board of elections to run as an independent. Zytkow is running in District 4 in northeast Charlotte. His opponent will be decided in an Oct. 8 Democratic runoff between Gregg Phipps and Wil Russell. Phipps fell two votes short of winning the primary outright. No Republican is running. A Wake Forest University graduate, Zytkow taught at Garinger High School as part of the Teach for America program. Last year he was a spokesman for the Occupy Charlotte protest. Michael Zytkow is a true patriot, one who wants the best for the City of Charlotte and is willing to work hard for the People. Not just another “politician” in it to protect their own career, Michael is here to promote systemic change, the biggest of which is actually listening to real people and not just focus groups. Way to go Michael. Michael’s campaign represents true democracy in action as envisioned by our founders. Not a professional legislator with entrenched financial backers, there are laws that have made the entry of third party candidates fruitless. Our founding fathers envisioned citizen legislators, individuals taking on the responsibility of governance for limited times. . In the Charlotte 4th district there is always a democrat party nominee. Not a republican in sight. How does this member of an organized political party represent the needs of his constituents if he is representing the agenda of a political party? How loyal to his constituents must he be if he can take their votes for granted just because he is the latest in a line of democrat party pols? Interestingly, Michael submitted more than twice the number of signatures needed to get him into this race. That is a larger number than the people of district 4 who actually voted in 2012. That shows a great demand for someone not beholden to any party politics or corporate interests–someone who will represent the will and the needs of all the people in the 4th District.